Known as Le Grand Refusé due to his exclusion and consequent abstention from the annual Paris Salons of 1836–48, Théodore Rousseau is nevertheless considered to be instrumental in the establishment of the Barbizon School of French landscape painting. Neither stylistically consistent nor a cohesive band of painters, this group held but one common credo—that humans and nature could coexist without the hierarchy of one establishing itself over the other. 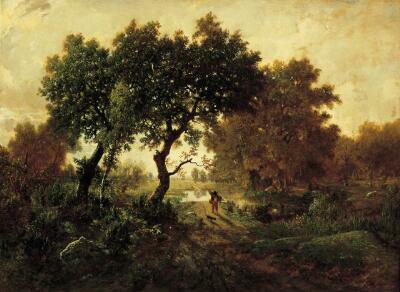 Rousseau’s unique approach, different from fellow landscape painters Corot, Daubigny and Harpignies, took cues from the idealized world of Romantic landscape painting and applied them to the less structured aspects observed while painting out-of-doors. Morning Effect, exhibited to much acclaim at the Salon of 1850–51, is a superb example of the liminal position of Rousseau’s landscapes. The morning sun creates a dramatic silhouette of landscape and fisherman, who appears to be just leaving with his morning catch. Located at the center of the canvas between an untamed area of forest at left and a cultivated pasture with grazing sheep at right, the fisherman assimilates peacefully and naturally into the meticulously executed rural setting. Charles de Férol, probably his sale (Hôtel des Commissaires-Priseurs, Paris, 22 January 1856, lot 22, sold for Fr 2,330). Friedrich Jakob Gsell, Vienna, by 1868. Emile Gavet (1830-1904), Paris, by 1872.